You girls are the best...you really are! I cannot say THANK YOU enough for all the well-wishes for my Mom! She was finally able to come home from the hospital today...but I think she has a long road ahead of her, and maybe one more surgery. But, she is a strong woman, so I know she will be back to her old self before we know it! Since I am on the subject of "Mom"...I thought I would post my very favorite photo of her and my Dad. 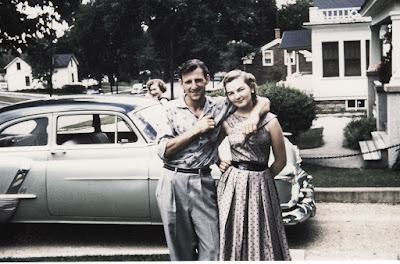 It was the summer of 1956, and they had just returned from their Honeymoon. My Dad was 22, Mom was 20. This past May they were married 53 years. Can you imagine? My Mom said she dreamed about that dress after seeing it in Vogue magazine. She worked and saved until she could afford to buy it. I think she still has it packed away somewhere. I just might have to dig it out one of these days! Oh, and check out their car! How cute is that? They had no idea what path their life would take...much like all of us...us they were young and just had simple dreams of a home...with kids...and living happily ever after. Now, here they are, 8 children later...21 grandchildren...and they can't belive how fast time has gone. Do you ever think about things like this? around how time goes by so fast. I absolutely think about things like that..and this last year was the fastest ever! What a wonderful picture of your folks! Isn't it incredible that there are 29 new people because of them...including YOU! I pray all the best for your mom and her recovery! I'm so glad to hear she is doing well and going home! I have been praying for her! I love that photo too - what a treasure you have there!! I can kind of relate with them now that I have children. My Aubrie is 4 and it just blows my mind all the time! It goes way too fast &my kids will be 20 before I know it! Plus, Jade & I have been together for more than 13 years. This fall I have officially loved my husband for half of my life - how crazy is that?!? What a beautiful photo. I think about how time goes. Two of my best friends have lost parents this year (we are in our early 30's) and we've been talking about the 'innocence' of youth. I'm so glad your mom is doing better. I'm so happy she's going on the road to recover. What a sweet photo, her hair is gorgeous, her dress fabulous and I love the way she is standing...too cute!! I am so happy to hear she is doing better, my well wishes for a wonderful and fast recovery! I sure hope your mom continues to recover & get stronger!